Italy will not ratify CETA, the trade agreement with Canada, as it does not sufficiently protect the country’s food specialities, Italian Agriculture Minister Gian Marco Centinaio said in an interview on Thursday (14 June). “We won’t ratify the free trade agreement with Canada because it only protects a small part of our PDO (protected designation of origin) and PGI (protected geographical indication products),” Centinaio told Italian newspaper La Stampa. The Comprehensive Economic and Trade Agreement (CETA) is a so-called ‘mixed’ agreement and therefore has to be approved both by the European Parliament – which validated it in February 2017 – and the national chambers. “We will ask the Parliament not to ratify the treaty and the others similar to CETA,” the Italian minister warned. Only ten members states – Austria, Czech Republic, Denmark, Estonia, Spain, Croatia, Lithuania, Latvia, Malta and Portugal – have endorsed the agreement so far. Italy’s decision may jeopardise the full implementation of CETA, the first major EU trade deal. The agreement entered provisionally into force in September last year with reduced import tariffs on a range of goods, but some provisions, including the chapters related to investment, will only apply once the text is fully ratified. “It is not just a position of the sovereignist Lega party, doubts about this agreement are common to many of my European colleagues,” underlined Centinaio, who belongs to Lega. The European Citizen’s Initiative Stop TTIP-CETA managed to collect more than 3 million signatures against both free trade agreements and thousands took to the streets to protest the deal around Europe. Moreover, the Belgian region of Wallonia used its veto power to impede Belgium’s signature of the agreement for days and negotiations almost collapsed. As part of the compromise to unlock the the deal, the Belgian government vowed to seek European Court of Justice’s opinion on the compatibility of a number of CETA provisions with EU law. The court has not issued its assessment yet. WTO Director General Pascal Lamy said during a conference in Brussels on Friday (8 June) that the main concern to be addressed in commerce was indeed the backlash in some western areas against trade. 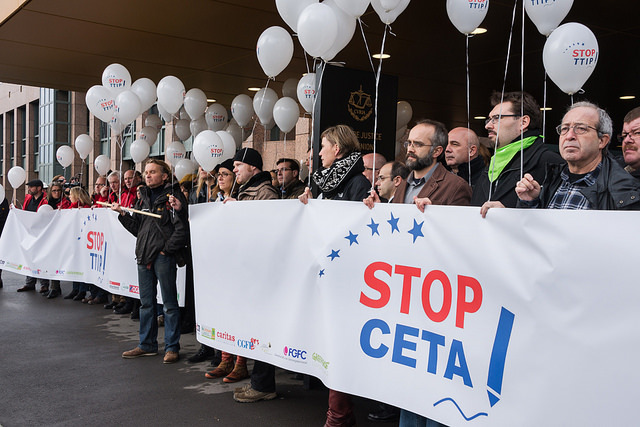 The EU has been struggling for a while to ensure CETA enforcement. “The Commission works closely with our member states to make sure that our trade policy is equally beneficial,” said European Commission chief spokesperson Margaritis Schinas as a reaction to Centinaio’s words. However, “the hypothetical non-ratification should be dealt with at the Council level,” Schinas stressed. 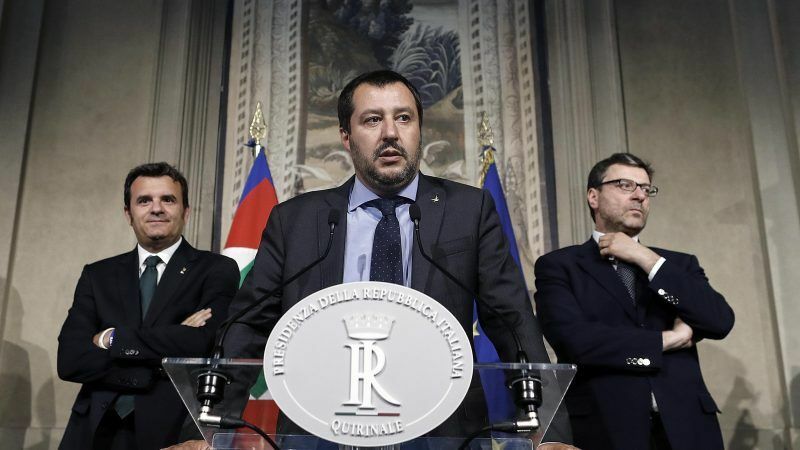 Italy’s announcement opened a new front in the already tight relations between Rome and Brussels, since the populist coalition of the far-right Lega and the anti-establishment 5 Stars Movement took office. Only in the past few days, Prime Minister Giuseppe Conte aligned with US President Donald Trump in his call for Russia to be readmitted in the G7 last week – though he later clarified this could only be possible if the Kremlin complied with the Minsk peae agreements. The Italian government also faced strong criticism because of the decision to close its harbors to foreign boats on search and rescue missions in the Mediterranean. In order to address these and other issues, Donald Tusk, the president of the European Council, may travel to Rome to meet Conte ahead of the 28-29 June summit, EU sources told EURACTIV. This is not just about recognition of various “Trade Marks” but about Lack of appropriate Food Safety measures in North America. Canada like the USA is rife with the prevalence of BSE (Bovine Spongiform Encephalopathy) in Beef and Milk, , Swine Fever in Pigs (again an encephalopathy disease) , and Scrapie in Sheep and Lambs (also an encephalopathy disease) as well as others including the massive E-Coli issues in Chickens and Turkeys as well as in Salad Crops and Fruit due to the continued spreading of diseased composts across crops. These issues we find are a serious concern and it beggars belief why some countries in Southern Europe have not understood these as much as those further north.